After fun on the Adelaide Ballzup beach zorbs, we headed back to Mosely Square with the 4-year-old begging to go on the jumping things. 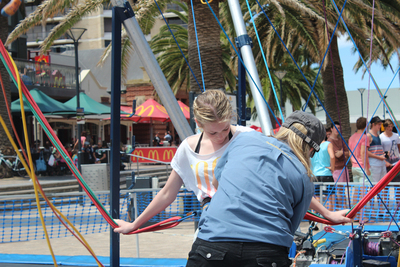 Pacific Fly Motion fun a bungee trampoline in Mosely Square, where you're strapped into a harness and jump much higher than you ever could in real life. All the kids have been on one before, and they were all keen to go again. There are four bungees, which mean that all four girls could go at the same time. The only real requirements are that kids (or adults) are between 9kg and 65kg. 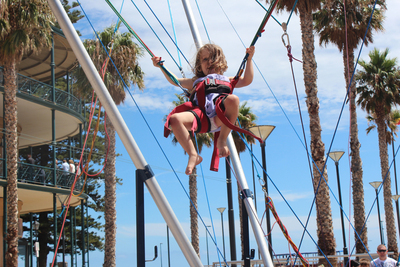 The 4-year-old had a bit of difficulty actual jumping, so she'd bounce a bit after the initial jump, but would then just hang there until one of the operators would come and bounce her again. Despite this she still absolutely loved it. The others had a great time jumping, and even the 13-year-old was enthusiastic. 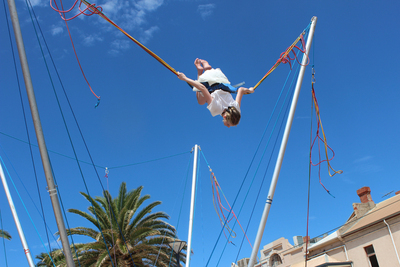 She managed to even do a couple of back-flips and forward-flips in the air. At $10 per jump it isn't that expensive, but when you've got a lot of kids it does take quite a chunk out of your pocket. It would be great with activities like this if they offered family discounts, it would make it a lot more affordable. If you're going on the beach zorbs, and then the bungee trampolines, with four kids you've already spent $80 on about 20 minutes of fun. 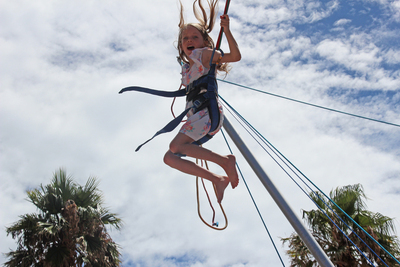 Whether they're doing tricks, or just jumping in the air, the bungee trampolines are lots of fun. 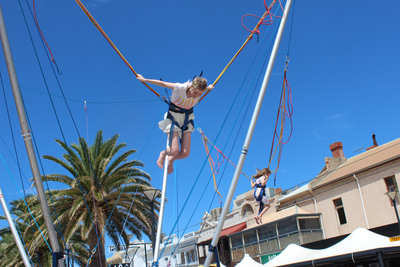 They're not only at Glenelg, and can actually be hired for events as long as there is space. So keep an eye out for them, or if you're organising a community event consider giving them a call. Unfortunately this isn't a permanent fixture, so there's not a guarantee it will be operating when you're down at the Bay. So if you're planning a trip to see them specifically, you might want to call in advance to check they're running.